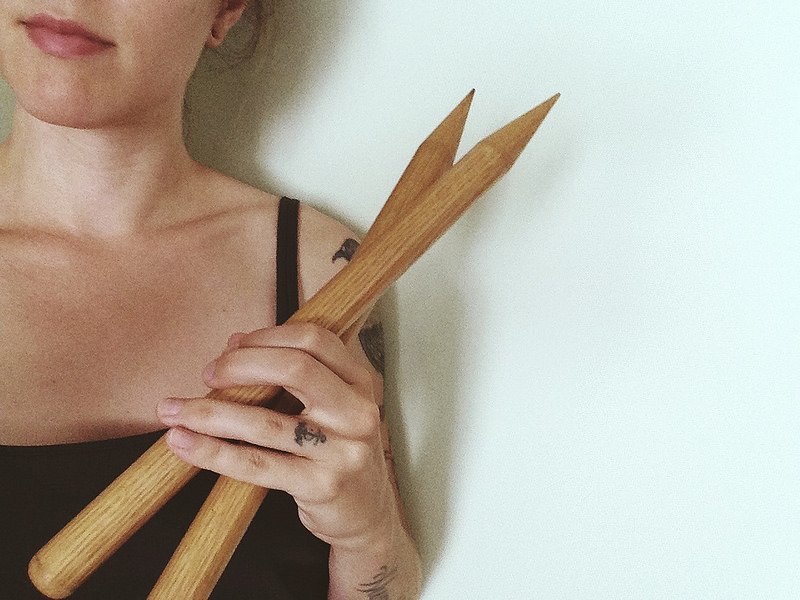 I have been following lots of excellent bloggers’ post about planning handmade wardrobes, and I have been following enviously, because I rarely apply that level of thoughtfulness to planning my own knitting projects. But it makes sense, right? Handknits don’t live in isolation, and they should be dream garments that integrate easily into our wardrobes and lives. A little ambitious, for sure. 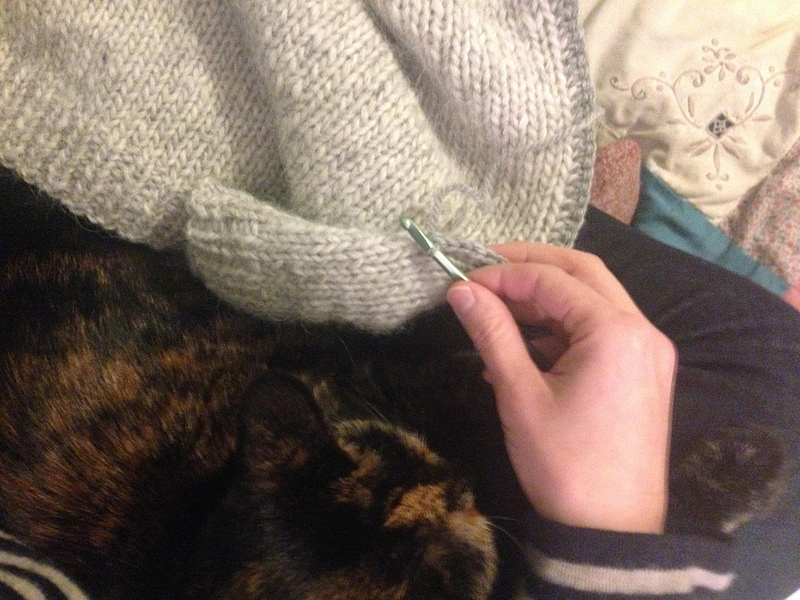 I am actually currently knitting Amanda, and just have one front panel and the yoke left to finish it up. Obviously, I’m looking toward mostly oversized cabled pullovers and cardigans that have the feel of a jacket. My Ravelry queue is literally over 20 pages long. 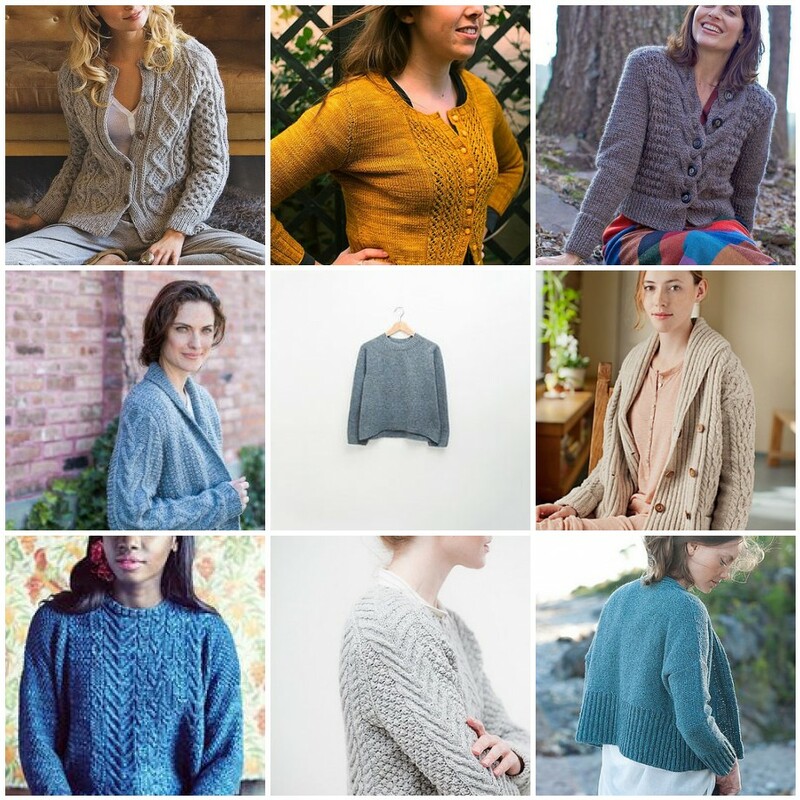 There are hundreds of projects I want to knit. But these are the ones that have the most immediate appeal. My eye is definitely wandering toward garments that are incredibly easy to wear, and sweaters that look a little more square than rectangular, with lots of positive ease. It makes sense – starting in on a new and challenging academic and professional adventure, I want getting dressed to be as simple and stress-free as possible. The above dreamy selection of sweaters would certainly accomplish that. 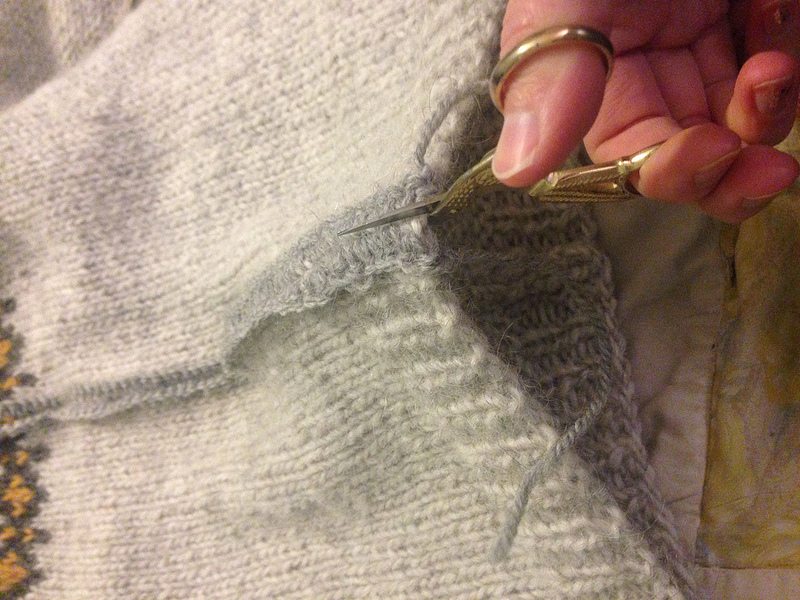 Sadly, all of this sweater planning does come with one casualty: the Stonecutters cardigan that I let languish for three years, and finally picked up to finish this spring, is officially too small. It technically does fit, but a little more snugly than I want (see previous note about positive ease), so rather than let it sit unworn on my sweater shelf, I’m going to frog and repurpose for the Nori cardigan. 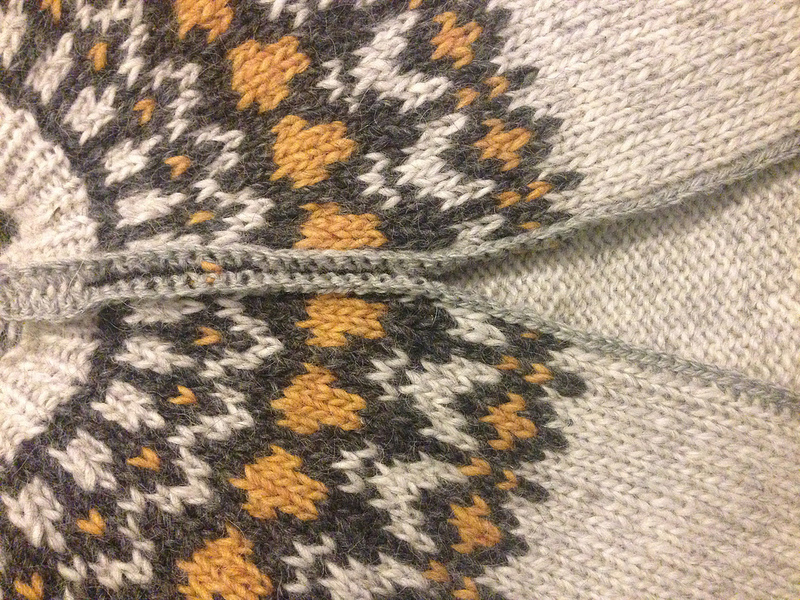 For several years now, I have been saying that cutting a steek is the knitting technique I would really like to tackle. In that time, it went from being a sort of curiosity to becoming my knitting Mt. Everest. Every January when knitting-world began to talk about new year’s knitting resolutions, I would tell myself that this would be the year, I would be bold enough to slice up one of my precious sweaters. As I became increasingly drawn to colorwork knitting, the drive got even strong. But when I actually thought about taking scissors to my knitting, I shrank back every time. 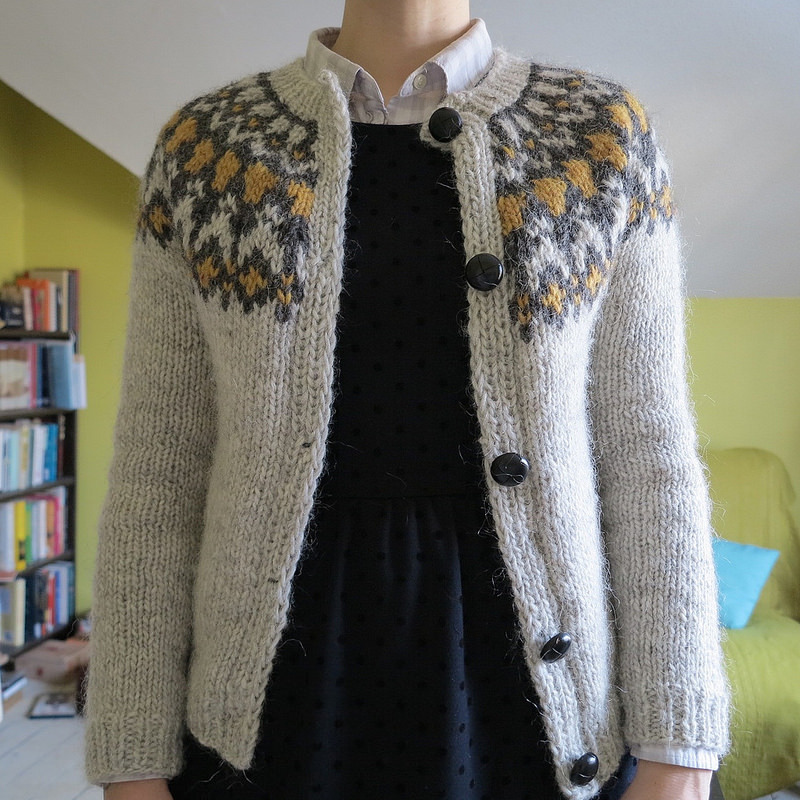 Last spring I knit my Hela sweater – intended to be a short cardigan, but according to Ravelry projects, often kept as a pullover. And it looks good that way. So when I began knitting my version, I had a cardigan in mind, but told myself that it would still work as a pullover in case I chickened out. Which of course, I did. As the weather got colder, I got a lot of wear out of Hela as a pullover, and I still loved it, but in the back of my mind, I knew I would like it more as a cardigan. 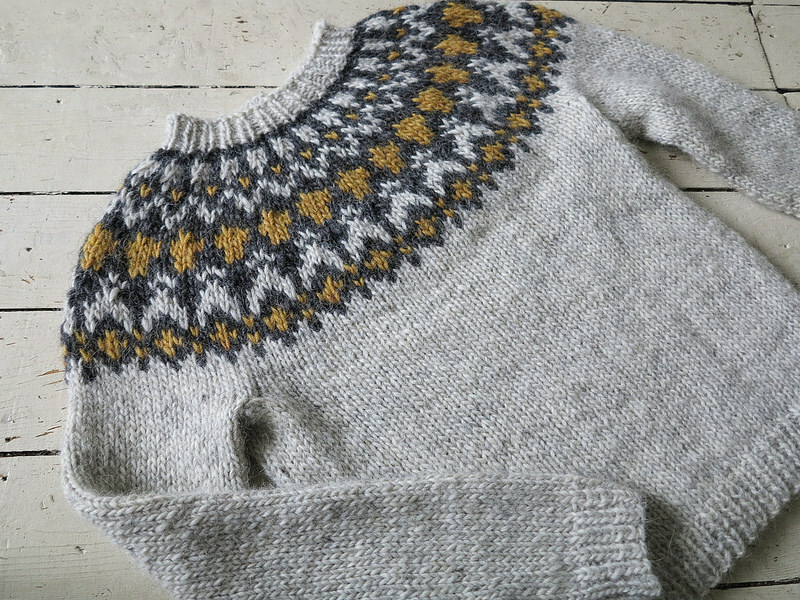 Had I intended it to be a pullover, I would have knit it a size larger, and added more length to the body. In a nutshell, I could tell that this sweater wanted to be a cardigan. So not long into January, I went home from work, pulled up Kate Davies’ steek tutorial, tried it out on a practice swatch, drank a little bourbon, and cut my favorite sweater in half. Here are a few process photos that I took on my phone while I worked – pardon the poor image quality. 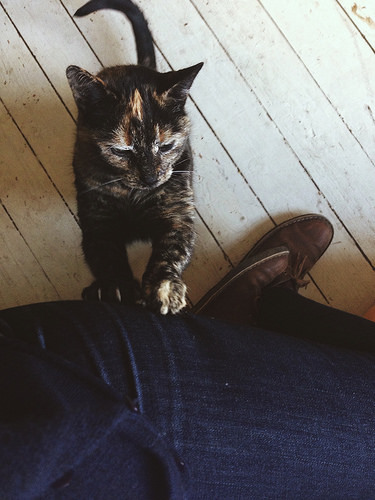 Do I get extra points for doing this with a cat on my lap? Rather than a zipper, I knit vertical ribbed button bands, which I seamed onto the steeked edge. I ordered some black leather buttons online, but was so excited to wear this that I attached some large shell buttons while waiting for the mail to arrive, and I have been wearing this cardigan nonstop. Now that my permanent buttons are here, I’ll sew them on and take real photos of the finished product. I’ve been fairly ambivalent about a lot of my knitting lately, and it’s really great to finish something that I love with no reservations. Especially as blizzards and freezing temperatures hit, I just couldn’t be happier that I did a scary thing (that now feels laughably un-scary) and turned a sweater I wasn’t crazy about into a sweater I know I will wear nearly daily. 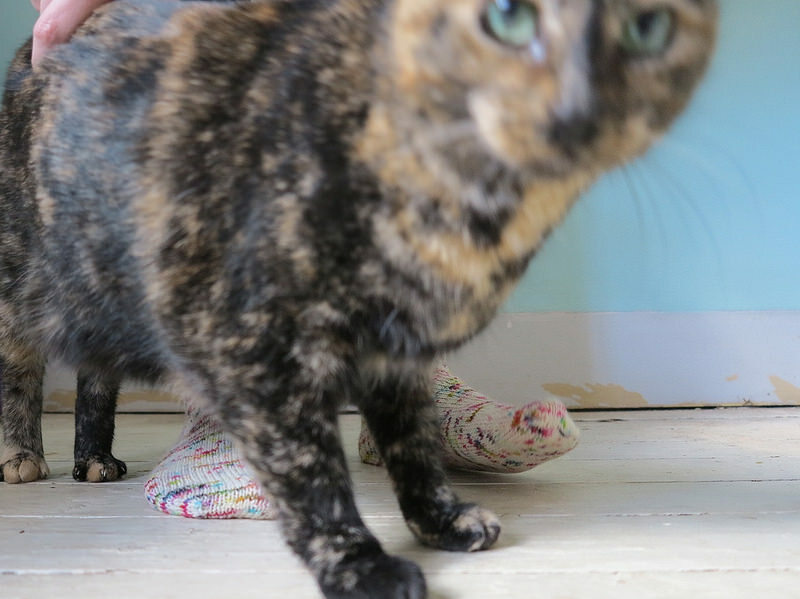 Does everyone else have these certain knitting techniques that intimidate them? 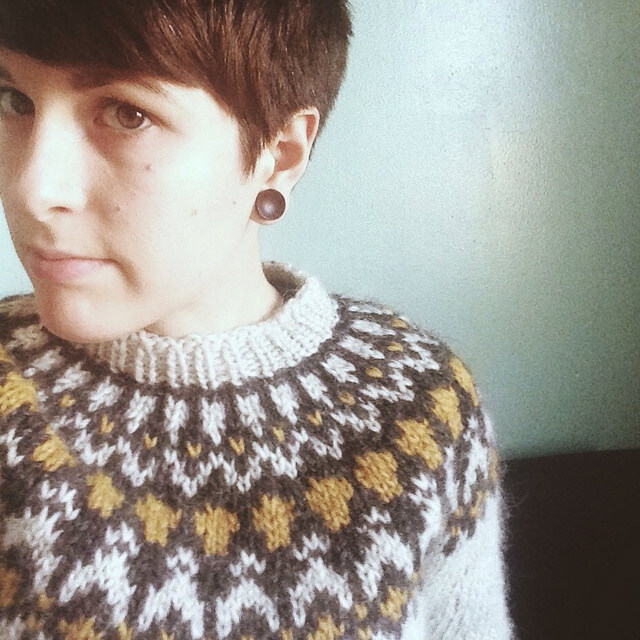 (The vast number of Hela pullovers as compared to cardigans suggests that the steek is a common fear.) It was my biggest one, to be sure. Now that I’ve done it, I don’t know why I was so nervous. I’m curious what other knitters are afraid to try. Almost two weeks into the new year, and I am still slowly thinking about the ups and downs of 2014 and what I hope to work on in the coming 11.5 months. I don’t make resolutions generally. I always hope to do all of the regular things, like save money, be healthier, read more, etc. I hope to do all of those things this year, of course, but I also have a few other intentions, things that I hope to work on right now. Last year I put most of my energy into my professional life. I spoke at professional conferences, collaborated on a paper for publication, served on two professional committees, and transitioned from a position more in the area of public humanities into a new job as an archivist, doing exactly the work I went to grad school to do. 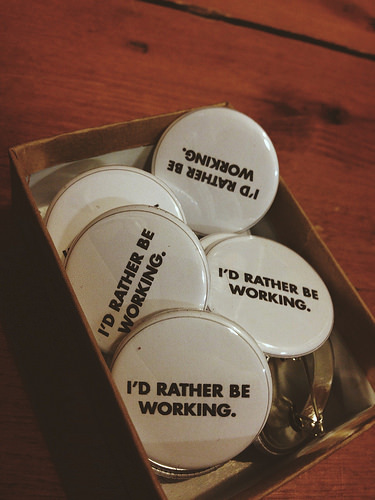 I love work, and I love working hard, but this year I hope to work at enjoying more leisure time. More reading for fun, more board games, more coffee with friends, etc. ETA with regard to reading, I should add that beyond the annual quantitative goal of reading 50 books, my major objective this year is to read more diversely, in every sense. As for knitting, I have a goal that maybe most knitters have this time of year, which is to knit primarily from stash. I have a lot of yarn. And admittedly, I have a lot of really nice yarn. I have gone through multiple destashes and am left with only yarn I do truly want to use, and so now the only thing left to do is really knit it. My plan of attack is fairly simple. I know I won’t go a whole year without buying yarn (that’s no fun), but I thought that at least these first three months of the year, I could knit entirely from stash. I have a few sweaters in progress, and projects lined up for a lot of other yarn. While it’s cold out, I’m just going to enjoy shopping my stash and rediscovering some old treasures while I enjoy lots of tea and Netflix. You may have noticed that my goal cutoff is right before the Webs anniversary sale in spring. I’m not claiming to be great at goals. But I hope that working with my stash for a few months without the distraction of new yarn will serve as a sort of reset on my buying habits. My knitting attention span has been pretty bad lately, but going through my stash shelves has gotten me pretty excited about knitting again, so I’m looking forward to these next few weeks. Anyone else have any stash-busting ambitions this year? I’m always curious how others accumulate and work through their own yarn. I usually run alone, but fairly recently I went running with a coworker and friend, and he invited a running friend of his along as well. Somewhere around mile five or six, she asked me, “So why running, for you?” That’s a hard question to answer, for me, and I have been thinking about it since then. I’ve been running off and on for about twelve years; this is the first time in about six that I’ve pushed through my three-month/three-mile threshold. For the past year I’ve been running increasingly long distances, trying to get out and run at least three times a week, with varying levels and styles of cross training. I don’t drive, so I do all of my daily commuting/traveling by bike, and I plan to get back to longer rides now that the weather is turning. I do yoga and lift weights when I can muster up the energy, and try to stretch a lot every day, even if I’m not doing any other exercise. Would that every day was gray and misty and there were never any other humans around and I actually invested in stylish running outfits. 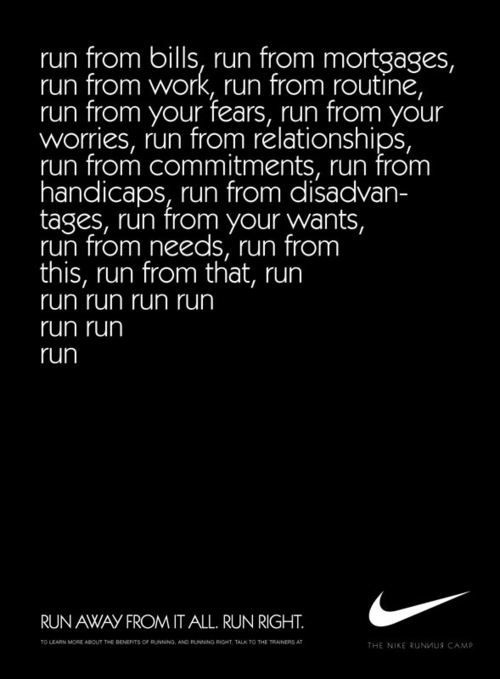 If running was like this, no one would ever ask why you do it; everyone would just want to do it. More accurate portraits of my current running life would include me shuffling in circles around the city of Providence trying to rack up a few more miles; me pouring Listerine over my broken toe so the nail doesn’t become fungal as it grows back in; me blowing my nose into my shirt because my allergies are terrible and I can barely breathe; me averting my eyes and turning the volume on my phone up so I can block out creepy dudes as much as possible while running in the city; new leg muscles rendering most of my pants too tight- do I need to buy new pants now, on top of everything else? It doesn’t sound so good. So there is still that question, why do it? I guess in spite of all of the above, this is how I relax. It feels good to be outside and moving, and to be in a kind of imagined isolation. I feel like my brain works better when I’m covering some physical ground. And because most of my day is spent at a desk, I feel especially grateful for the literal change of pace. Put simply, maybe there is a reason it is called running away from your problems. 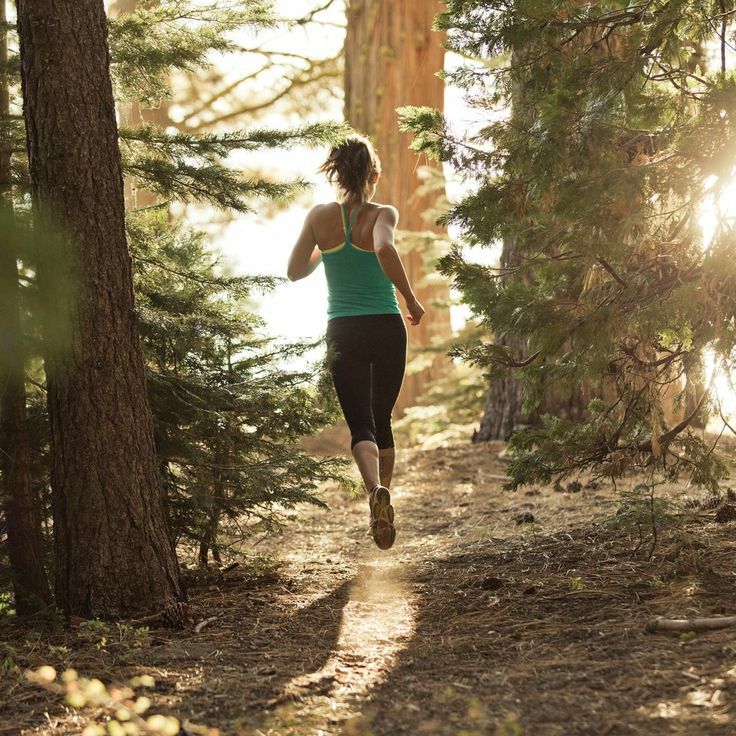 A special bonus is that when you’re done running, all problems are put back in perspective. This past Sunday, I ran my first half marathon. I say first because, although six months ago I registered for the event unsure that I would actually push through the mileage and feel ready to run 13.1 miles, but now, instead of feeling like I’ve reached a goal, I feel like I’m just getting started. I feel lucky that I’m able to do this because I can’t imagine being able to lose myself this way in anything else, and it feels good to see how far I’ve come in just the last six months; I can’t wait to see where I am in another six. It’s different, but I feel somewhat about running the way I feel about knitting. They share a meditative quality, and the potential for constantly overcoming new, small obstacles. In both cases, I feel like I’ve reached a point where these are things that I crave as a part of my day, and know to factor into my daily routine. It feels good. ETA: This post popped up in my feed via Fit and Feminist (highly recommended). It’s always worth reiterating that thinness is one of running’s top PR problems. As alluded to above (re: my pants), running hasn’t made me thinner, and it hasn’t given me fitspo muscle definition. But has it helped me conquer body issues by reminding me what my body is capable of doing? Yup. 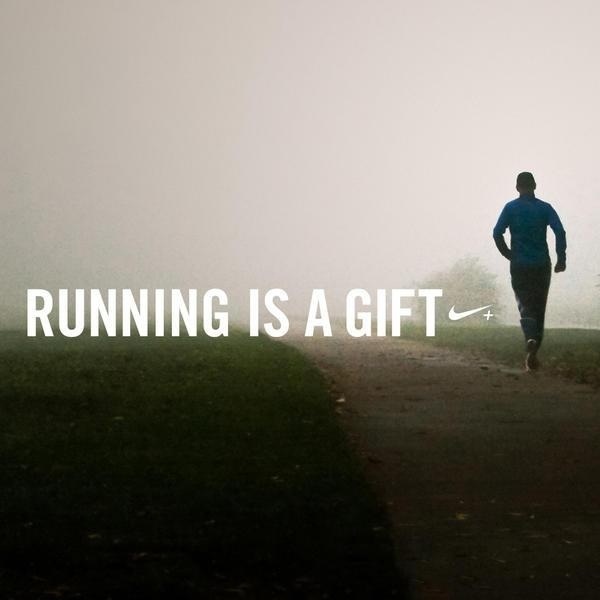 And that is certainly another thing that makes me glad to be a runner.